Baby Black and White Cookies are smaller in size than the classic black and white cookie but fresher and tastier than the average store-bought black and white cookie. Pin this for the next time you host a shower, reception, or party. 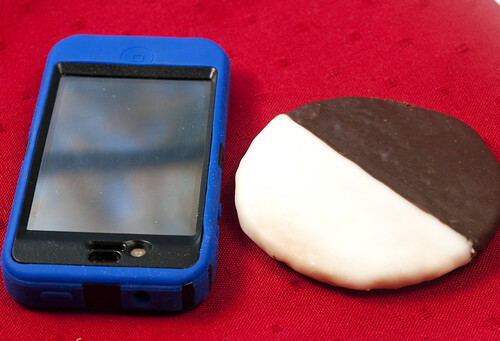 Black and White Cookies are supposed to be BIG. REALLY BIG! I’m no expert but I think you’re right. Traditionally, they are so big that they really need to be shared. I’m not good at sharing. So I came up with Baby Black and Whites that would be more appropriate for parties, showers, etc. When I first heard about Black and White Cookies, I became obsessed with finding the best recipe. Wanted to add the recipe to my frosted cookie collection. I tried several recipes before I perfected the recipe you see printed here. My co-workers, acted as official taste-testers. They declared this version the winner. My friend Daphne, who remembers eating them in California, excitedly proclaimed them authentic. I’ll take that as a high-flying endorsement. Start with the white frosting first. For some unidentified reason, I find it easier to get a neat look before I drag chocolate into the whole scheme of things. Finish with the chocolate icing. No question about it. That little offset spatula knife you see in the picture really helps to do a neat job where the black and white meet. Worth the investment if you don’t have one already. Did you notice anything interesting about the frosting on these cookies besides being half ‘n’ half? The glaze goes on the bottom of the cookie, not the top. If you do it the usual way with frosting on top, you’ll be struggling mightily to keep the dividing line straight between the vanilla and chocolate glaze. Besides that, they won’t be like a real, authentic Black and White Cookie. Preheat oven to 400 degrees F. Prepare cookies by spraying with vegetable oil or cover with parchment paper or silicone baking sheet. Second: Sift together flour, soda and salt. Beat butter until smooth and light in color about 3 minutes. Add sugar and continue beating another minute. Add in egg and beat until light and fluffy. Stir in lemon oil and vanilla. Add flour mixture alternately with the yogurt mixing gently just until mixed. 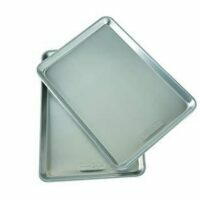 Drop by large spoonfuls onto greased cookie sheet or sheet lined with parchment or a silicone baking sheet. I use an ice cream dipper for uniform size that holds approximately 1/8 of a cup. Use 1/4 cup for the large size. Bake in oven preheated to 400 degrees F for 10-12 minutes until lightly browned. (Longer for classic size.) Remove slightly cooled cookies from cookie sheet after 2-3 minutes. 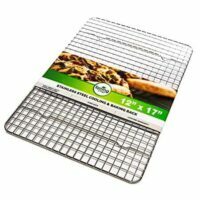 Leaving on the sheet too long will cause the bottom to absorb moisture and roll into crumbs when removed from the tray. Speaking from experience, this will spoil your icing job. 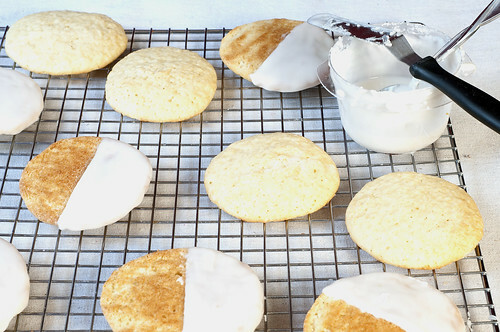 Make glaze while cookies bake. Apply vanilla glaze to one half of cookie and let it dry before spreading chocolate glaze on the other half for the neatest application. Allow glazed cookies to dry for several hours. Add hot milk to confectioners' sugar and stir until smooth. Add remaining ingredients, stirring again until smooth. If glaze gets thick, add a few drops of hot milk. The lemon oil can be purchased online, at health food stores, or specialty grocery stores like Central Market or Whole Foods. Leave it out if you wish or use anywhere from a few drops to 1/2 teaspoon depending on your taste for lemon. I personally like 1/4 teaspoon. Substituting lemon extract gives a different flavor I'm not all that crazy about. Yummy! It looks so good. My kids should bring these cookies for their snacks. Thanks a lot for sharing your recipe. I think adding chocolate syrup all over the cookie is yummier. It is greater if the inside is also milk and chocolate flavor. White bread and chocolate brad is better to make than just on the outside. good idea! they look yummy. these are executed perfectly! i have made my own version, but they were not as pretty as these. i am going to give yours a try! Those cookies look delicious! And you’re right, I think 5-1/2 inches is HUGE…no wonder so many of us are fat! I can’t wait to try your recipe. Thanks for sharing it. Wow, these look gorgeous so black tie affair, thanks for sharing your recipes with the rest of us! 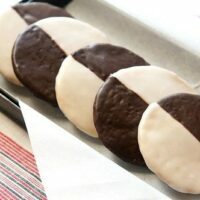 Your Black and White Cookies look fabulous! And what a clever and fun idea to have “Brett’s Birthday Picks” on the sidebar!!! Uptown Girl. 🙂 They’re so chic – I love them. And totally agree on the spectacular opening photograph – stunning! I’ve made those ridiculous bullseye, and checkerboard and striped shortbread cookies (chocolate and vanilla dough), but these look somewhat easier (and more fun)! 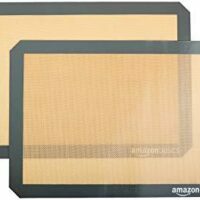 Just remember, bigger ISN’T better. Here’s to petite b&w’s! Your cookies are stunning! 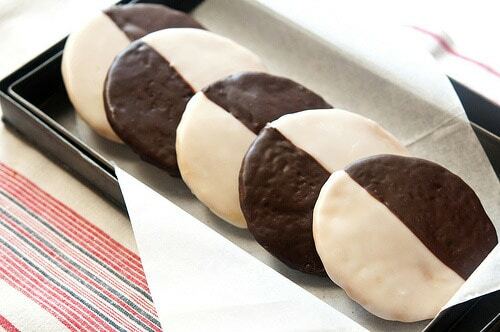 I love a good black and white cookie- and there are as you said many recipes out there to choose from. Thanks to Daphne for urging you to post the recipe. I’m going to give it a try, I can almost taste the chocolate side now . . .
I’m a HUGE fan of B & W cookies. They are definitely one of my favorites. I love that the frosting dries up on these. That’s the way it should be! I am definitely gonna save this one! You have every business being in the Black and White cookie area! These are beautiful and so evenly frosted on each half! The biggest difficulty I’ve read about making Black & Whites is how to get the frosting perfectly spread. Everyone here is right, your version looks like a work of art! @hat technique did you use to get the icing divided and spread so perfectly? Do tell! So good to see you again Nancy! Glad you had a safe trip home. Ladies….I hate to brag, but I actually was treated to these cookies when I was visiting Paula’s house! What can I say? YUMMY!!! I’m no expert on black and whites but they look pretty fantastic to me. The chocolate glaze is one of the best I’ve ever found. Refrigerates well too. Both vanilla and chocolate would probably taste great on a sugar cookie but can’t say I’ve tried it personally. I laughed all the way through your post as you got me thinking about one of my favorite Seinfeld episodes….Thanks for putting me in a good mood!! These look DELICIOUS! The lazy girl in me is wondering if I could try your glaze on cookies from a tub of sugar cookie dough. Now, off to find the Seinfeld episode on the internet. Laughing at “the portion control police”–I think we Americans need more of those! Your little black and whites are stunning! Like the above commenter said, they are little works of art. I agree about the portion control police. Need one following me around, especially when these cookies are sitting on my kitchen counter. These cookies look like a work of art. I could see the first photo hanging in a museum of modern art and not in the cafeteria! I know why your recipes are ones I can always count on for being delicious… because you work so hard at trying and perfecting each one. And then you are kind enough to share! What kind words Lorraine! Considering the gorgeous photography on your own blog, I take that as a high compliment.